Rail Enquiry On Whatsapp - This Is How You Can Do It In 2 Easy Steps! 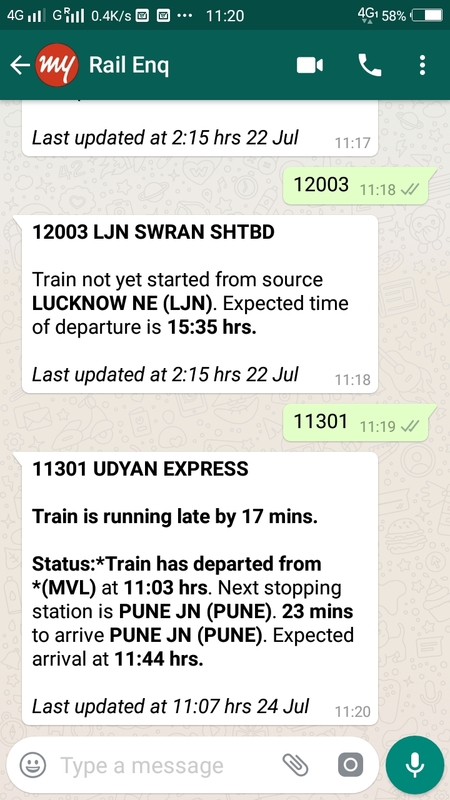 Train enquiry on Whatsapp now! In yet another innovation, Indian Railways has now made possible train enquiries via Whatsapp. This service has been launched in partnership with MakeMyTrip. We will soon share how you can do this. Meanwhile, travel partners of IRCTC are upset because now, they will need to pay more service fee charges for booking train tickets. The increase in service charges is almost 10-times of existing rates. Will travel partners ditch IRCTC now? Train Enquiry on Whatsapp: 2 Easy Steps! As of now, 139 is the main hub for enquiring about any train; besides few online tools from the Railways. But now, for the first time ever, passengers can get updated information about trains via Whatsapp, directly. Step 1: Add this number into your Whatsapp: 7349389104. This is a number provided by MakeMyTrip, exclusively for Indian Rail passengers. Step 2: When you want to enquire about a train, simply type that train number, and send it to this MakeMyTrip number. As per the claims of IRCTC, the response shall be received within 5 seconds. We tried checking few trains on our Whatsapp, and the service is working fine. For instance, we checked the current status of 11301 Udyan Express from Mumbai to Bengaluru. We received the exact location of the train. However, when we searched for another train whose departure hadn’t yet happened, it informed the same. The only drawback which we experienced is that, we don’t the option to choose the date of running. Hence, if a train started yesterday, then this Whatsapp based number won’t inform me the exact location, and will say that the train hasn’t departed today. We hope that choosing the date of departure will also be added in the system. Online Travel Partners Upset With IRCTC? Meanwhile travel partners and agents who book tickets on behalf of IRCTC are upset, because now, IRCTC has increased the service charges by 10-times. As per latest notifications, the annual maintenance charges (AMC) for booking every ticket is Rs 12, plus taxes for travel partners and agents. This is somewhat good news for smaller agents and ticketing partners. Earlier, IRCTC used to charge a fix amount for giving ticketing contracts, but with per ticket cost involved, even smaller players can participate now. Besides this, IRCTC has also announced that OTA or Online Travel Agencies would be allowed one booking per 70 searches; and any search or enquiry beyond that will ne charged at 70 paisa per enquiry, plus taxes. As per some insider reports, large OTAs are not happy with the changes, and they will soon approach IRCTC for revising them. "Rail Enquiry On Whatsapp - This Is How You Can Do It In 2 Easy Steps! ", 5 out of 5 based on 1 ratings.